In 1947, Nolan visited Fraser Island in Queensland, where Captain James Fraser, his wife Eliza and his ship’s crew famously became captives of local Aborigines after becoming shipwrecked on a reef hundreds of kilometres north of the island in 1836. The Captain and some members of his crew were speared to death but Eliza survived and was effectively enslaved by the Aborigines. Nolan was fascinated by the narrative of Mrs Fraser and the mythology that grew around her, including her relationship with the convict David Bracewell and he created a series of paintings based on their story. Here, Eliza Fraser is depicted staring at her dying husband whose body is pierced by four spears. She has been stripped of her Victorian attire (except for her red stockings) and stands naked, covered in mud to protect her white skin from the fierce sun, and her head is adorned with feathers. She blends in with the landscape which is punctuated by low-lying vegetation, and a makeshift tent. 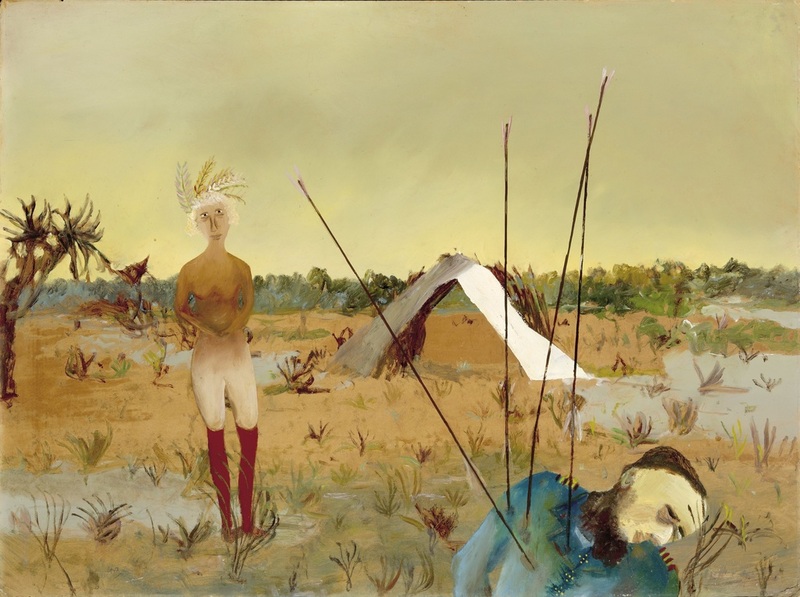 Nolan’s Eliza Fraser series of paintings gained prominence after one of the works was reproduced on the cover of the important Australian novel A Fringe of Leaves, written by Patrick White, whose imaginative re-counting of Mrs Fraser’s story was inspired by Nolan’s paintings.